I'm still tinkering with her - but Pixel x Pixel is moving to Word Press! Jaynie - in all her Jayners glory - has provided us with an excellent blog post about the Olympics and its effects on new technology. Check it out here: The Web Outside. This comes courtesy of Eddy - LOVE it. While I was visiting with Marcia in Kansas City, she admitted to her lack of technical knowledge. This as I went into my "digital" job description. What she compared it to was awesome. "It's like when my Grandmother was afraid to use the thermostat because she thought she would break it." 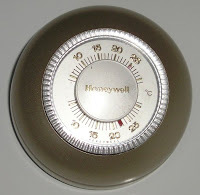 Amazing to think that a thermostat was once considered high-tech. I wonder what it's going to be for us thirty-somethings. To Marcia: You will not break the Internet. Only Abby has that power. 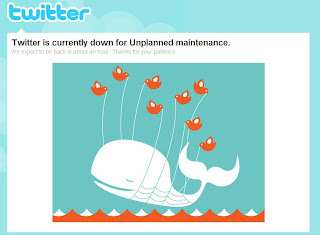 As I finish AdAge's article on Twitter and its problems with down time, I go to tweet about it to my Tweeteroos...Twitter is down. Marketing Vox is reporting that Esquire magazine's October issue will have a digital cover - scrolling and movement oh my! I am suspect...yet entirely excited to see this in action. Ford has bought the inside cover - no word yet on what they will be doing with it...but wow, will there be a time when flash ads are featured in magazines? When ads actually have the ability to exist in the physical world, but allow for interaction? All the buzz around AMC's Mad Men is becoming palpable. Are we far from returning to the days of smoking and drinking in the office? (I do have a bottles of champagne and wine at my desk...hmmm) - Should we be scared? Agency Red Tettemer is so excited about the upcoming season 2 - and delighfully glowing in the back of publicity the show is receiving (giddy up PR bandwagon!) - that they have redesigned their website to reflect the TV show. Bhars - I vote we host a happy hour Friday in honor of the show. 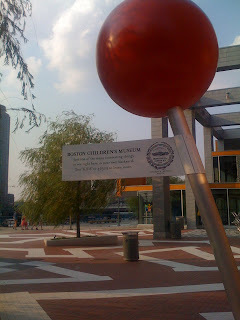 These push pins, encouraging walkersby to text to learn more about the particular area (this one is the Children's Musuem), are pushing up all over Boston. Love that the city is embracing mobile technology...too bad it couldn't get out of its way to provide free Wifi thoughout the city.